The answer to that, is somewhere very special indeed. It’s a hidden gem of a space with a story of destruction, neglect and regeneration. 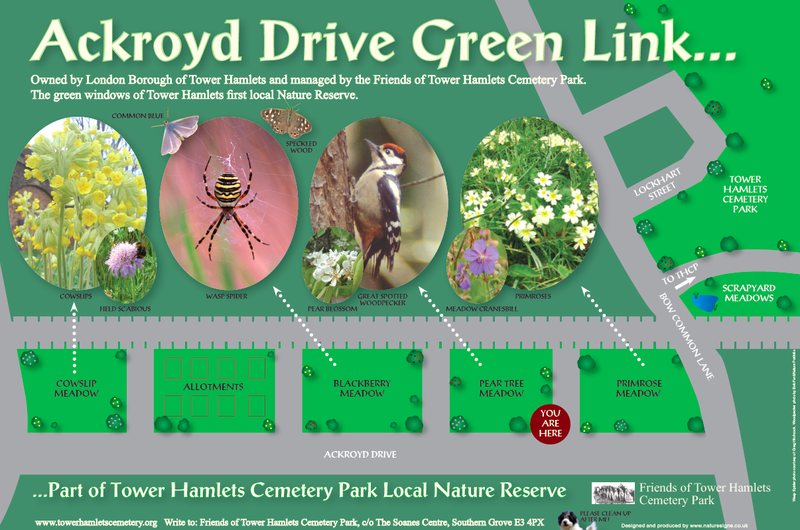 Now home to a host of wildlife, the permanent home of ENDANGERED13 will be on Ackroyd Drive Green Link at Tower Hamlets Cemetery Park. 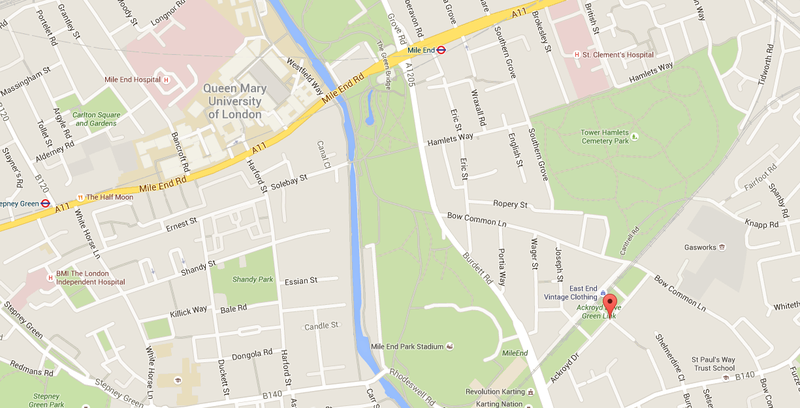 A short walk from Mile End Underground, it’s a beautiful urban park with over 30 acres of woodland in the heart of East London. Opened in 1841, The City of London and Tower Hamlets Cemetery is a Local Nature Reserve and Site of Metropolitan Importance for Nature Conservation. 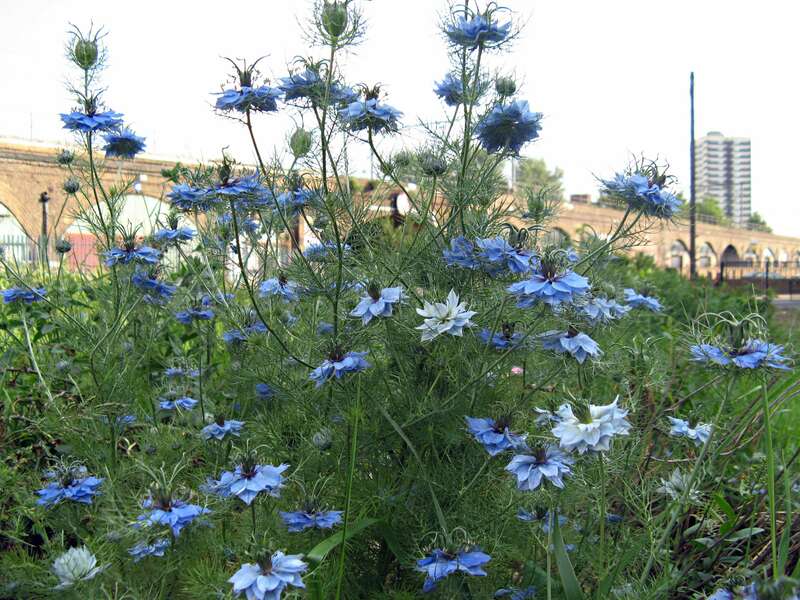 It is run by our project partners, The Friends of Tower Hamlets Cemetery Park. Many visitors to the Cemetery Park will not have seen the Ackroyd Drive Greenlink, it’s the part of the Local Nature Reserve which gives a “green corridor” between us and Mile End Park. The Greenlink has four compartments: Primrose Meadow, Pear Tree Meadow, Blackberry Meadow, and Cowslip Meadow. Adjoining Cowslip Meadow is a small allotment site. The importance of the site is not only as a wildlife corridor, especially for birds and insects, but because of its position opposite Poplar Harca’s densely populated Leopold Estate. It is a resource on people’s doorsteps perhaps more so than the Cemetery Park itself. The land had remained undeveloped after its housing was destroyed in World War II. In the 1980’s, the then Liberal Democrat Tower Hamlets Council worked with the London Ecology Unit to make the land suitable for public use as well as wildlife value. Railings and paths were installed, rubbish removed, land reshaped and new planting carried out. The land gained the status of metropolitan Open Land, which gives it very substantial protection against development. By the mid 1990’s, The Friends of Tower Hamlets Cemetary park (FOTHCP) was well established and taking a lead role in the management of the closed cemetery itself and the adjoining Scrapyard Meadow, so consequently the Borough asked the Friends to take responsibility for the Greenlink, enabling it to receive a higher level of care. The four compartments have both common themes and their own individuality. All have areas of open grassland and some trees. All have a great many flowering bulbs, between February and May, with Autumn crocuses in October. Primrose Meadow is mainly low lying and damper than the others. The dampness has enabled us to establish a good population of snake’s head fritillaries, dangling their dark purple chequered bells for a fortnight in April. As the name suggests, there are many primroses. But there are even more snowdrops. All the meadows have a great variety of crocuses and daffodils. In summertime, meadow cranesbill and hemp agrimony flower in abundance. There are several large white poplars, so named because the undersides of the leaves are covered in dense white down.